The plan for today, was to take a different route and, skip going to the dam. Headed to the Okukubi River and, I wanted to start on the east side for the best light. 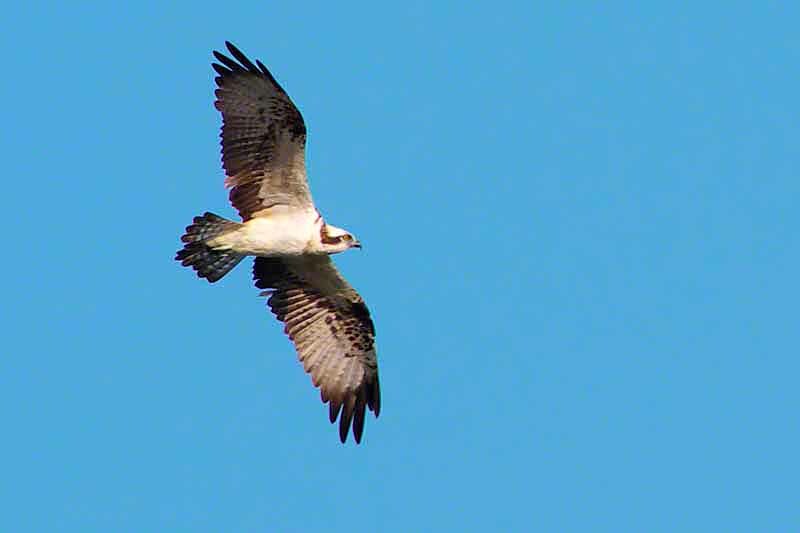 Crossing the Kin Bridge, I spotted some osprey flying so, hung around awhile. Satisfied, I had taken a couple of good shots, off to the other end of the bridge I went. On a hill across the river, dangerously close to a ledge, I noticed someone standing. The thought had occurred to me, "Shoot the guy; it's an interesting image." But, I didn't. I was out , to do some wildlife photography; not people. Three quarters of the way, crossing the span, this guy started waving, frantically, at me. He wanted me, to come over there and, motioned towards the road leading to his location. By the time, I arrived at the path, going to his property, he was at a gate, waiting for me. It was then, I realized, I had met him a few years ago. He invited me in, opened several gates and, gave me a tour of all his land. First, he told me, the ospreys happen to be living on his property. Wow. I want to see ! Being a dog type person, dogs don't scare me. Unless they are big and growling, at me. "Does he bite?" "No, not if, you're with me" he replied. The dog just, kept growling. Then, we had to go visit some baby goats and their mothers. That was fun. I suppose. We wound up, walking through a couple of gates, where everything was fenced off. Finally, we got to the cliffs. I was hoping, he'd show me where an osprey nest, might be. He just said, he didn't know but, they come around here every year. That's it ? Being a polite person (momentarily) I thought it might be a good idea to change the subject. So, I told him, this month there will be a humongous full moon. Then, he walked me to the eastern cliffs, to show where the moon rises. He scampered up this pile of dirt, near the cliffs, to show me, the best position. Dude, "You're wearing boots. I'm not climbing up there wearing flip-flops." He agreed, shima zori (flip-flops) wouldn't be safe, for cliff hanging. Yeah ! Originally, the idea was to walk the east bank of the river, to the ocean. High tide would have been around 9:20 AM and, that's what I wanted to see. After touring all his acreage, we passed through all the wire gates and, said goodbye to the kids. It was time well spent, I suppose and, I'll probably visit, again sometime. Instead of heading down to the ocean, I decided to walk around the dam, instead. By the time, the camera got downloaded, there were over 400 images complied. Plants, trees, ferns, birds, hills and flowing water, are in the pending files. They are both correct, An osprey, may also be called a sea hawk. Osprey are on the Ministry of Environment Red List as Near Threatened (NT) Species. Okinawa Red Data Book -- Vulnerable (VU).